Please call owner Lynnell at 781-864-2488. Boat Location: Southold, Long Island, New York. Excellent Condition Price dropped for immediate sale Need to sell this great, fun, clean, excellent 1994 Freedom 170 Four Winns. Comes fully equipped so you could be boating, tubing, fishing this week It spent almost all of its life in Fresh Water Lakes so the boat, motor and trailer look new. 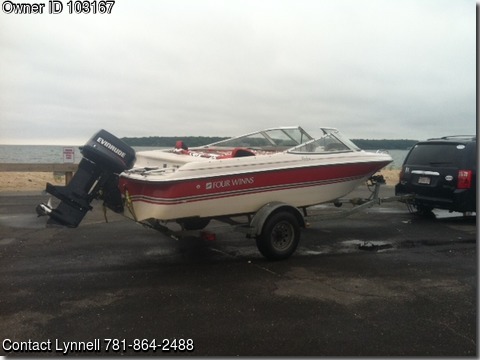 The motor is a 1994 Evinrude 115 HP 2 stroke outboard, gasoline 20 gallon tank engine. All but 15 hours were in freshwater. The trailer is a 1994 Four Winns trailer. You would be only the 4th owner. It comes equipped with a three person Air Head Tube and towing rope too. Price dropped for immediate sale. Please read all the details and features. New Battery Sept 7, 2017 New Rectifier like an Alternator installed August 2015, New trailer lights July 2015 New Neutral switch in Control box installed July 2017 New Bilge Pump July 2017, New safety chain on front of trailer July 2017 Tow bar for tubing and skiing, Two Coast Guard approved cushion life preservers, One Cost Guard approved life preserver Two wells in the backstern can be used for fish, bait or icedrinks, Humminbird Depth Gauge and Fish Finder Extra 2-stroke engine oil gallon All manuals Boat, Motor, Humminbird, Covers certificate showing sun-protective materials Many covers Regular storage covers front and stern with bars to keep water from pooling, Bimini plus front cover, back cover, and side windows, Winter coverage to go over the entire boat Extra prop, Extra anchor, Trailer has spare tire, Three person 'AirHead' Tube Tow rope for tubing or skiing, Glove Box with lock for valuables Horn in dash whistle in glove box flairs in glove box, Plastic 2-gallon extra gas tank container for carrying extra fuel, Winterizing items motor fogger, greaser, engine ear muffs for flushing engine and also for starting motor when not in water. New speakers New uninstalled Pyle PLMRKIT105 Marine Boat Yacht CD MP3 Aux Radio Player 4-6.5" Speaker w/Cover Storage under front seats, under back seats and under main seats. Note main seats recline fully as well. Backseats slide out middle section first, then slide out side sections. Tow Bar in holder at stern on floor. For towing, slide bar into hole at transom and then connect on the floor. Tags Bowrider, bow rider, fourwinns, FourWinns, tubing.